Wayne State University Press, 9780814343814, 80pp. Janet Kauffman describes "eco-dementia" as a paradoxical condition of humanity-possessing a love of the living world while simultaneously causing and suffering from its destruction. Like other dementias, losses are profound. We lose touch, we forget. We don't recognize our own home-the habitat that sustains us. What has driven us to exploit more and more resources, even when risking self-annihilation? Eco-dementia is not nature poetry but an immersive language in the tangle of the living world that asks the question: can we survive this relationship? 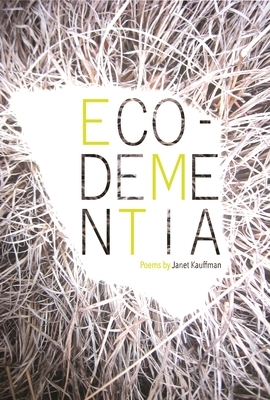 The poems in Eco-dementia took shape in one decade of the author's life. In three sections, Kauffman reflects on insanities and devastations, from the personal to the global. From her father's Alzheimer's and the ravaged world of his mind to the horrors of Abu Ghraib, Hurricane Katrina, and toxins in Lake Erie, as well as the planetary-wide ecological catastrophe of climate change. Yet despite this devastation, it is possible to surround ourselves in light and air, to touch the tall grasses we love, to step into water and shade and feel an intense, momentary joy. Kauffman's poems show the bliss within the elemental richness of the natural world and also the violent distortions and grief at its devastation. Like learning a new language, we can see and hear words, sometimes understanding so clearly and other times not at all. Or as Kauffman's father puts it, "I know where you live, but I don't know who you are." The language of these poems is the physical material of a damaged world. Readers of modern and experimental poetry will treasure this collection. Janet Kauffman has published three collections of poetry and numerous books of fiction, including the award-winning book of short stories, Places in the World a Woman Could Walk, as well as the creative nonfiction collection, Trespassing: Dirt Stories and Field Notes (Wayne State University Press, 2008). She lives in Hudson, Michigan, where she restored wetlands on her farm, now protected as a natural area for ecological study.